“Turn off the video game and come to the table now!” It’s 6:05 PM at the Macready residence, and the evening “ritual” has begun. Six-year-old Richard has been at his video console for an hour and half now. At first, Mom was happy because the game kept him quiet so she could prepare dinner. Now that she is ready to serve, Richard can’t seem to make the transition from video game to dinner. “Get away! Leave it alone!” Richard shouts at his four-year-old sister, Maggie, who has decided SHE wants to play. And now the conflict escalates. “Frazzled” does not begin to describe the combination of frustration, anger, and exhaustion that Mom feels at this point. Fortunately, the next afternoon while relaxing at the park with her children, Mom is talking to another parent whose child has been in traditional martial arts. That brief conversation is exactly why you want your child in a traditional martial arts program. 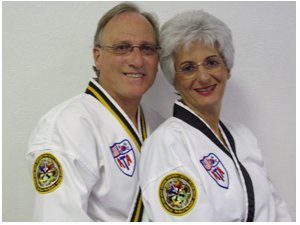 WHY ENROLL IN TRADITIONAL MARTIAL ARTS? 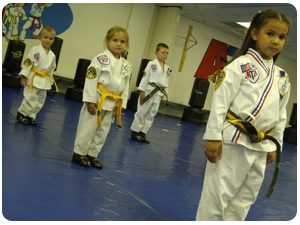 Investing in traditional martial arts training for your children is one of the best things you can do. In fact, it ranks right up there with orthodontia, tutoring, and music. All of these qualities or skills become the foundation of a successful life, and that is why you should enroll your child in a traditional martial arts program. A PARTNER IN PARENTING, TOO! The story above which mentions turning in the “report card” is the number one reason for finding a good traditional martial arts class for your child. Good instructors use this tool to help shape the behavior that parents want. It is a very simple concept which helps children understand that ALL the important adults in their lives—their school teachers, their baby sitters, their karate instructors—not just their parents—expect the best behavior. In a traditional martial arts program, parents and instructors become and unbeatable team, molding children for the path to success. And I’m sure that’s something you want, too! Do not mistake size for quality. The martial arts industry has matured a lot in the 21st century, and there are many operators that have the finances to provide large, sharply appointed facilities (3000-6000 square feet). Sometimes the service does not match the facility. However, the opposite is also true. There are many successful operators with large, nice facilities that have strong ties to the traditions of their arts and provide high-quality instruction in a modern, spacious building. And there are also instructors who make very creative use of just 1500 square feet by the way the schedule their classes and divide their student groups. So SIZE of the facility is NOT your first criteria. Where the academy is located in relation to your home is very important. A good instructor will always say something like “It is better to attend twice a week for a year that it is to attend four times a week for five months.” A good program uses the “tortoise” approach, not the “hare” approach. Westerners, and especially Americans, are used to the intensity of seasonal sports. Martial arts training is much more moderately paced, but produces its best results when the training parallels the normal physical, social, and cognitive growth of a child, especially from around age 4 or 5 up to age 11 or 12. So prepare yourself to be at the academy twice per week and sometimes three for a special event. All of these thoughts mean that an academy within 5-6 miles of your house will be most convenient. With that said, just because an academy is closest to you does not mean that it will be the best fit for your family. I have known students to drive fifteen and event twenty miles to be with the person they consider “their” instructor. So the instructor and the curriculum are very important, and you cannot overestimate the value of being with the right instructor. And the “right” instructor is the one with whom you are the most comfortable. Please understand this: big classes do not mean poor instruction and small classes do not guarantee good instruction. Children need to learn how to function in a class setting because most education takes place in groups of 20 or more. A martial arts school with a student-teacher ratio of even 20 -1 is offering a class experience very similar to what happens in school. In these days of “virtual reputations” it can sometimes be hard to get to the truth about a business. Every website on the internet is collecting customer comments and offering the “bold truth” about every business listed there. Be wary when reading online reviews because the internet makes it possible for any customer who did not get what he wanted suddenly to be an expert on how THAT business operates. And for every single disgruntled customer, most businesses have hundreds of happy ones who just don’t bother to post comments. For example, I go to a tire store looking for a particular tire. They don’t have it at this time and they don’t offer payment terms like my old tire store did. So I get online immediately and give them 0 out of 5 stars and talk about how they don’t serve customers. And my comments become a permanent part of the online record. And meanwhile, the twenty-five other customers who were served happily on the day I went in there go completely unnoticed on the internet. If you are going to read reviews on the internet, then be sure to READ ALL OF THEM, including the ones “blocked” or excluded by the reviewing site’s algorithm. And always remember that talking to actual customers—people who have already purchased, and especially those who have been there longer than one year—is the best way to learn what a business is about. Remember, it is a daily part of commerce everywhere that what a business offers may not fit what a customer is looking for. Some disappointed customers call this “poor service” when it is simply the choice the business owner has made to offer certain products or services at certain prices, terms, and times. In the “old days” before the internet, you would talk to your neighbors and friends and family about where they bought tires or had the car serviced or ate dinner or bought a karate program. You might try that approach to find a great martial arts program. And here’s a crazy idea: stand outside the place you are considering and chat with parents as they leave class. You probably won’t be able to learn much about the instructors or the curriculum in one visit. And exactly what they teach will seem foreign to you. Martial arts are not like football, baseball, golf, or tennis. Most American parents know the basics of those sports, but know little or nothing about taekwondo, karate, kung fu, or jujitsu. So instead, I suggest you look for some kind of national or organizational sanction for the academy for one main reason: most organizations require background checks to certify instructors. And you should enroll in an academy that offers this feature as part of their training of staff. Pricing for martial arts classes will vary depending on the cost of living in your area. For example, consider the cost of housing. It is much more expensive to rent a studio apartment in Manhattan than it is in Gonzales, Louisiana. So if you are living in metropolitan Los Angeles, expect to pay more than if you live in Flagstaff, Arizona. With that said, please also consider if the academy is professionally run. In other words, you can find recreational classes often offered through municipalities or churches for as little as $25 or $30 per month or $30 for an eight-week program. Beware, this offer is exactly what it is….a very cheap class. It does not have any long-term goals in mind and is probably taught by a different instructor every time it is offered. The next level of instruction comes from the part-time instructor who already works a different full-time job and teaches karate on Tuesday and Thursday evening. This “weekend warrior instructor” may be very talented, but he does not have the time or energy to develop a program that has a big enough scope to bring out all the best in your child. He might offer comments like, “I’m not here to make money,” when he quotes a price of $50- $75 per month. How much is that kind of training worth? Perhaps more than $200 per month. Don’t be afraid of contracts or memberships. Having read this far you know that your greatest benefits in a martial arts program will derive from being there for two, or three, or four years, NOT six months. Most academies offer some kind of trial membership or introductory guarantee, so take advantage of that, try it for a month, and then commit. And a membership will help you guide your child through those “plateaus” in learning and those moments when progress becomes difficult. In fact, it is true for all endeavors that when things get difficult, you are about to experience your greatest moment of growth. We all want to quit when we don’t get what we want or when it just seems too hard to continue. A membership means you have an instructor who is committed to helping your child through these difficult times and teaching him the real value of effort. Learning this life skill is critically important to success in all other areas, especially academics. Does the place have a ‘family feel’ to it? Do you see other families like yours their? Do you feel comfortable talking to the instructor you met? Does the place seem to have a loving, fun atmosphere? Trust your gut and move forward. Ten years in the future your decision to enroll in martial arts will have as large or even larger impact on your child as his academic life! Take some time and do some research. Visit the facilities, look at the class size, meet the instructors, put your child in a free class and see how she does, talk to the members, and then remember this: what value can you place on having a well-adjusted thirteen-year-old who knows how to set goals and face difficulty? What value can you place on a well-focused sixteen-year-old who is learning to drive? What value can you place on confident fourteen-year-old who has learned empathy through her martial arts training and now becomes an anti-bullying advocate in her middle school? Sleep on those thoughts tonight and tomorrow morning, start looking for a great martial arts academy in your town!